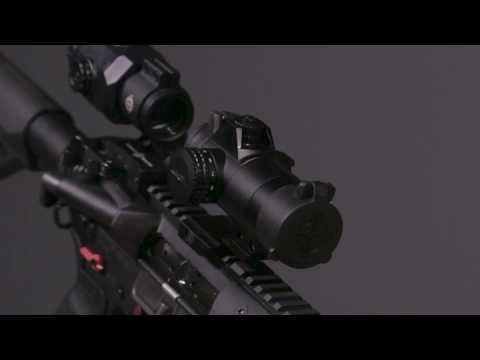 The innovative and improved Element 1x30 from Sightmark is a 2 MOA red dot sight, perfect for both-eyes-open shooting on AR rifles and shotguns. The Element features a practical clamp mount, reducing bulk and creating a sleek, streamlined design. Perhaps the most useful of all the Element’s features is the adjustment caps; the Element’s windage/elevation caps can be flipped and used as tools for making adjustments. The design of the sight also naturally protects these adjustment caps with raised edges. A rugged and compact aluminum alloy housing keeps the Element 1” shorter than the competition and provides increased durability in the field. This versatile red dot is night vision compatible and works in conjunction with magnifiers to help shooters at further distances. Waterproof up to 3 ft. and shockproof up to 3 ft. on concrete, the Element provides anywhere from 100-15,000 hours of battery life from one CR2032 depending on which brightness setting is being used. The Element 1x30 Red Dot includes flip-up lens covers, battery and manual.